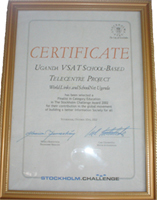 The World Links /SchoolNet Uganda VSAT School-Based Telecentre project was announced one of the 101 finalists for the Stockholm Challenge Award in the category education. The Stockholm Challenge prize is awarded annually to projects in seven categories, based on their levels of innovation, improvement of people’s lives, transferability to other contexts and increased access. The purpose of the challenge is to highlight success, honour those who drive the innovation and progress fundamental to the Information Society and to stimulate the exchange of ideas and best practice. Begun in 2001, with the support from the World Bank Institute, World Links and Bill and Melinda Gates Foundation, the Uganda VSAT School-based Telecenter project deployed earth-satellite VSAT technology in remote communities around the country, focusing on areas where dial-up or spread-spectrum had not yet penetrated. The VSAT installations offered a round-the-clock access at 256 kilobytes per second (KBPS). The VSAT network of 15 sites shares the costs of this solution. Schools provided core financing through student tuition fees (each family pays a token fee on top of tuition) while the community was allowed regulated access and paid for use at determined fee. The net result was that the VSAT Telecenter operated without administrative or financial problems and the community, through its participation in a management committee, was involved in the planning and operation of the installation. The project had nation-wide presence in Moroto, Lira, Kabale, Hoima, Masaka, Jinja (5 sites), Iganga, Luwero, Mbale, Soroti and Arua. It was implemented locally by SchoolNet Uganda. SchoolNet Uganda was represented by Mr. Meddie Mayanja, at the 3-day Global Forum in Stockholm, Sweden. The Forum is convened to enable finalists to forge new collaborative networks, increase their visibility among potential funders, exchange solutions, generate new ideas and craft a vision for an equitable and empowering Information Society.